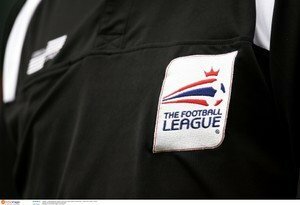 Rotherham United welcome referee Peter Bankes from Merseyside back to the New York Stadium on Saturday for what will be his third time in charge of the Millers this season. Last time Peter was in the middle at the New York Stadium was in September when Frank Lampard’s Derby County were the visitors. Former Miller Tom Lawrence saw red for the Rams for a reckless challenge on Richie Towell while his Manager was also sent to the stands with ten minutes to go. In between this Kyle Vassell was brought down in the area and Ryan Manning stepped up to score from the resulting penalty kick which gave the hosts a one-nil win on the day. The first time Peter was in the middle for a Millers game this season was in August when Wigan Athletic were in town for the first round of the Carabao Cup. Rotherham won the game three-one with two goals from Jamie Proctor and another from Semi Ajayi with James Vaughan replying for the visitors. Wigan’s Alex Bruce was the only booking of the evening. This season Peter has shown sixty-nine yellow cards and two red cards in the fifteen games he has been in charge of. Running the line for this South Yorkshire derby we have Timothy Wood and Jonathan Hunt with John Busby as the Fourth Official.